44AD is a community focussed gallery, with affordable studio spaces & workshop in the heart of Bath. 44AD's landlords, B&NES Council want to put it's rent up to full commercial value - they don't see the positive impact it makes on the city, as 44AD doesn't fit the format their calculator needs. 44AD will have to shut down in January 2017 if an affordable rent cannot be agreed with the landlord. 44AD would be unable to fulfil it's aims of providing affordable studio spaces, a non-commercial gallery and a community arts space in the centre of Bath under these conditions. FaB have worked alongside 44AD for years, as an exhibition space, for meetings, events, training sessions, and it has been an amazing place to recruit Artists, Curators and Volunteers!It is an invaluable resource, bringing immense benefit to the city, communities within it and far beyond. Please sign the petition here, to help 44AD artspace remain one of Bath's best contemporary community arts venues for years to come. See www.44AD.net for more info. 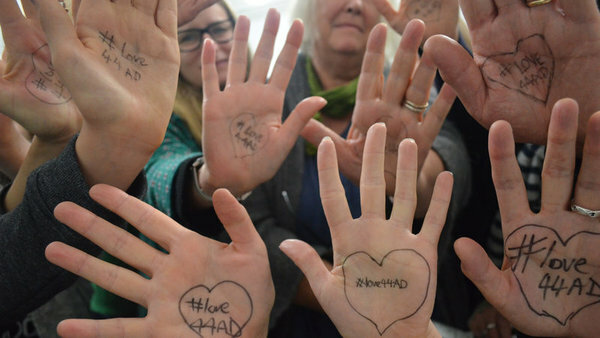 You can also help us create a visual petition: write #love44AD on your hand and share a photo via social media - make sure you include #love44AD so they can find it.